You are currently browsing the Bookmobile News weblog archives for January, 2013. When we hatched the idea for a mural on one side of the Free Bookmobile, the priority was simple: it needed to be eye-popping. So we are just thrilled with this amazing act of love created by Maria Carillo Art Teacher Extraordinaire Catherine Borchert and her advanced students! 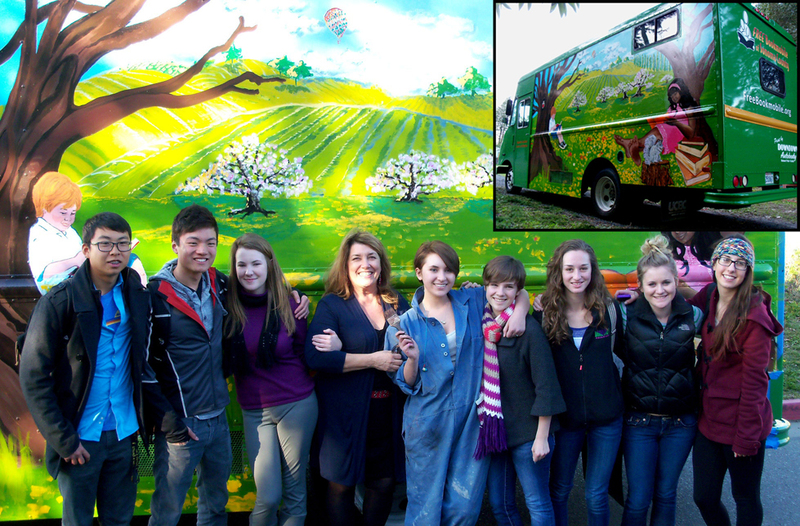 Our mural is rolling testament to the joys of reading outside in the Sonoma County springtime. It’s even more gorgeous in person so you simply must check our event schedule and make a plan to come see the finally completed new look. In the meantime you can see a bigger photo on our Facebook page, which you don’t have to join to view, by clicking this link. Pictured above is the dedicated art crew (Catherine at center left), who came out morning after morning in freezing temperatures, conjuring magic to make their paintbrushes dance and flow! We would also like to offer special appreciation to Maria Carillo Career Technical Education Teacher Lonnie Harwell and his students for their invaluable assistance in caring for the vehicle while it was at the school, and for sharing the shop space that facilitated a great final stage of creation. A positive image is critical for our organization, especially as we depend on public support to continue our important work in promoting literacy. This beautiful mural, already being admired by thousands of our fans and patrons as we resume our travels, will create awareness of what we do and will also attract new children and families to the vehicle, helping us serve more of them in the years to come. Thank you, Catherine! Community Foundation is making the world a much better place! They were there for us when we were just getting off the ground, helping secure donor-advised funding to purchase our vehicle. They were there for us the following year when we needed to raise awareness of our success and expand our operational resources. And now we are delighted to announce another grant made by their Healdsburg Area Fund to help the Free Bookmobile continue its important work in the northern end of the county. We will use this support to bring high quality books to children, adults, and seniors throughout the Healdsburg & Geyserville areas in 2013, as well as to establish a permanent Neighborhood Library in Geyserville. This is our second year in a row earning an award from the HA Fund and we feel blessed by the partnership. A huge thank you to all the CF donors, board members and grant committee!